Ran good, drove in the garage it shut off. Tried restarting started then immediately stalled. Now it cranks but no sound from fuel pump, no spark at coils or wires. Replaced crank sensor and cam sensor checked wiring and replaced battery cable ends. Checked all fuses tried Solus scan tool had crank sensor code replaced crank and cam sensor cleared the code now no codes are coming up. Have twelve volts going to ECM, but I checked the connector to the crank sensor and there is no voltage at all coming from the connector cranking or no cranking does matter no voltage. Checked wiring and it looked good and ideas and is it the ECM? Also, checked ECM fuse with tester have power there checked ignition coil fuse, nothing fuse is good same with fuel fuse no power but fuse is good. Have you checked the ASD relay under the hood in the relay box? No, will do that today and let you know the findings. Not finding that relay under the hood here is a picture of the relay box. But, I do want to add that when cranking the engine the I get hit and miss power to the fuel pump as well as spark. Car will start with starting fluid but shuts off immediately. Checked all fuses and relays everything is checking out good. Im sorry but I would like to look at the fuse panel to see if we have the right car? Can you upload a picture? Yes we have the right car. You said that you don't have park but when you spray fluid the engine will run until the fluid runs out? This is telling me we have spark but not fuel. 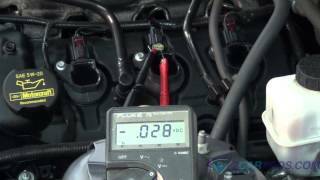 Can you try testing for power with the key on at the fuel pump relay? Yes the problem im having is when I turn the key on there is no sound from pump. As I have my wife crank it with a tester in the fuel pump connector its cranks over a few then tester lights up then nothing. She shuts the key off then trys cranking it the same thing happens. I put a spark tester with a light on it and when cranking it show spark then no spark. I checked the fuses and fuel pump relay seems to be getting power. Did notice that the fuse labeled ignition coil was doing the same thing no power with key on or cranking then shows power then nothing. I really do appreciate you trying to help me with this problem cause im really stumped. Thank you so much! If the main relay is going out it will cause the problem have described. If that ends up being okay I would say it is the computer issue which will need to be programmed at a shop. Here is the ECM location.